P22 type foundry and the Hamilton Wood Type & Printing Museum are proud to announce a partnership that brings 19th Century ingenuity into relevance with the latest online technologies. 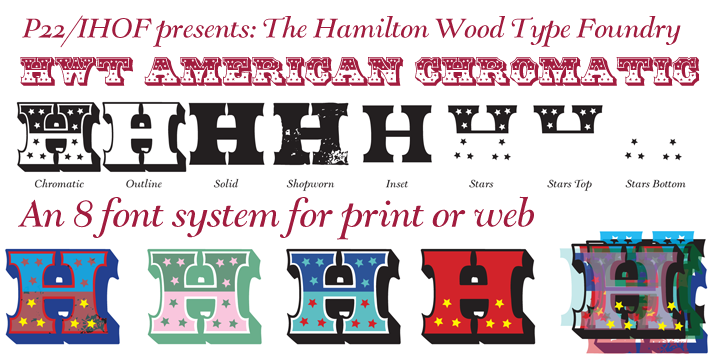 This joint venture, known as the "Hamilton Wood Type Foundry" (HWT), will see a large collection of wood type designs converted into digital fonts that can be used with the latest Webfont CSS and Opentype programming abilities. P22 is working with the Hamilton Museum and other collections of scarce printed specimens as well as actual wood type to render these classic designs into fully functioning computer fonts. The Hamilton Wood Type & Printing Museum in Two Rivers, Wisconsin is the only museum dedicated to the preservation, study, production and printing of wood type. 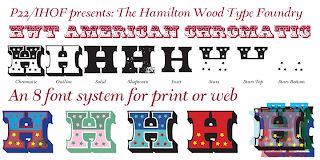 With 1.5 million pieces of wood type and more than 1,000 styles and sizes of patterns, Hamilton's collection is one of the premier wood type collections in the world and an unparalleled source of research material for type designers. P22 type foundry, an independent design house, has been making computer fonts inspired by historic lettering styles for over 18 years and currently has over 1,000 unique designs in their font offerings. P22’s attention to historical accuracy, along with acknowledgment of the source material, has made it a go-to source for iconic and important fonts including those associated with the Arts and Crafts Movement, the Bauhaus, famous artists' handwriting and the legendary London Underground lettering. The inclusion of HWT to the P22 roster is a perfect addition to the legacy of keeping classic designs relevant and usable in contemporary design. The first release from HWT coincides with the US Presidential election season. "HWT American Chromatic" evokes classic Americana with stars and multi-color layering options. This highly decorative font set can be used in print and online display for sincere and ironic uses alike. The original design from 1857 was created as a two part font that selectively overlapped parts of each letter to achieve a third color where the inks overlapped. These 'chromatic' fonts are considered among the high points of the wood type era. Coincidentally, the latest introductions of web based typography allows for layering and transparency that directly parallels the innovations of the 19th century…for today's web use. This font will be available to the public in the first week of October 2012.